Well, hello there and a hearty welcome to you! Since last we spoke, I've been working hard (phew! ), and playing even harder (woohoo!) I even managed to sneak in a trip to Cairns over the long weekend, for some much needed fun in the sun. I'll be blogging the trip soon, and of course I'm working on my September Unblogged Files. However, today's sudden sunny weather had me in the mood to share a couple of fun springtime recipes for dainty finger sandwiches! When I hosted my Father's Day afternoon tea recently, my dad told me he was most excited about the sandwiches. The sandwiches! Apparently they remind him of his childhood. 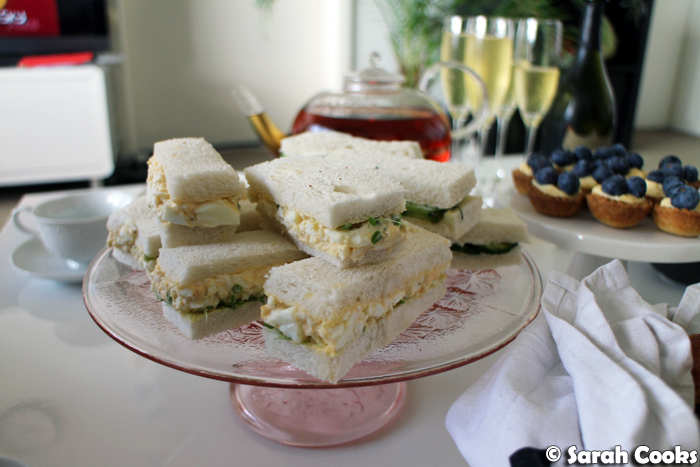 For this particular event, I made two types of finger sandwiches, and decided to go super traditional with the flavours: egg and cress, and cucumber. Use super-soft white bread, WonderWhite or similar. This isn't a chewy ciabatta or a hearty wholewheat sandwich, but a delicate, light and fluffy treat. You don't want to be working your jaw too hard, you want pillowy-soft bites of deliciousness. Make sure the butter is nice and soft before spreading, so you don't rip the bread. To slice the sandwiches, use a sharp serrated knife and gentle horizonal sawing motions. This will let you slice the sandwiches without squishing the filling. Try to serve as quickly as possible after assembling, so that the bread doesn't dry out. You could cover with a damp teatowel or gladwrap if you have to wait a short while, but I'd avoid making these so far in advance that they need to go in the fridge, as this seems to dry the bread out faster. Start by cooking the eggs. Place the eggs in a saucepan of cold water. Place on a medium heat and bring to the boil. Once it comes to the boil, immediately clamp on a lid and turn the heat off. Allow to sit for 8 minutes. Drain the eggs and rinse under cold water until cool enough to touch. Peel the eggs and place in a bowl. Mash the eggs with a fork, then add the mayonnaise, and a generous amount of salt and pepper. Mix to combine. Butter the four slices of bread. 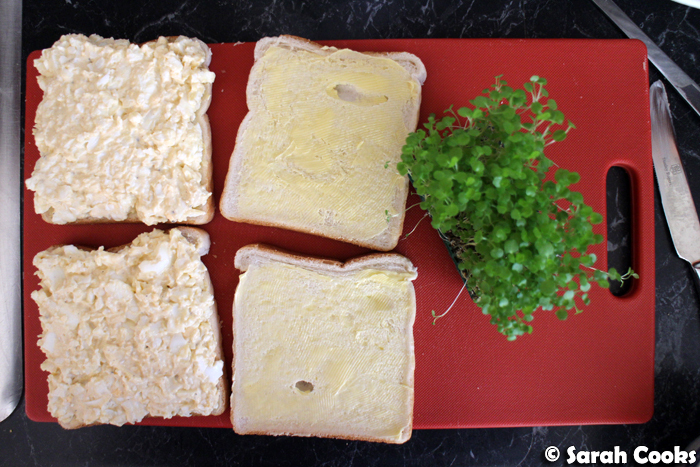 Spread the mashed egg onto two slices of the bread. Top with the other slices, to form two sandwiches. 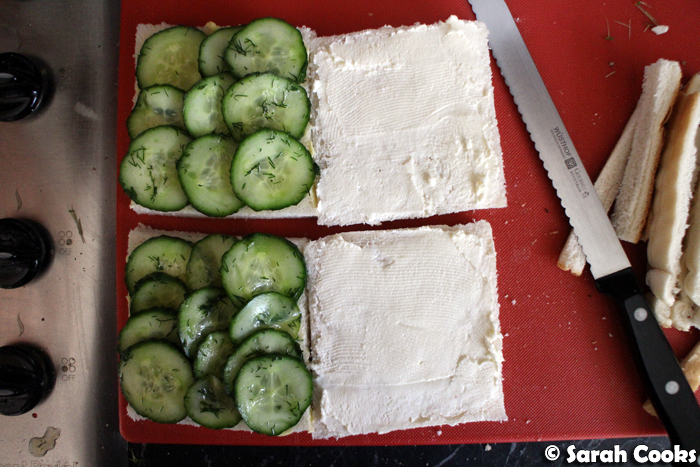 Gently cut the crusts off, then cut each sandwich into thirds. Use a sharp serrated knife, and use gentle horizontal slicing motions, to prevent the sandwiches from squishing. Mix together the vinegar, dill, salt, and castor sugar, and add a good grinding of black pepper. Finely slice the cucumber. Add the cucumber to the vinegar mixture and stir to cover the cucumber slices. Set aside for at least 20 minutes to marinate. Meanwhile, butter two of the slices of bread, and spread cream cheese on the other two slices. Drain the cucumber slices, and arrange them on the buttered bread. Top with the cream cheese'd bread slices, to form two sandwiches. The sandwiches are my favourite bits too! And yes the softer the better. I've seen places cover them with tea towels and the worst thing is when the bread is crusted over. These look downy soft Sarah! Dainty and flavourful, everyone loves to indulge in tiny bites of traditional sandwiches. I love this recipe!